In ancient times dance was neither a form of artistic expression performed by a bunch of experts nor a performance of athletic and technical prowess. It was used as a tool to achieve a state of ecstasy where the dancer, letting go of its false perception as a separated unit, would uncover his true nature and surrender to the guidance of Spirit. The whole point of this way of dancing, as well as chanting or producing sounds, consists of releasing the identification with the ego, the separated self, and thoroughly experiencing a multidimensional enlargement of consciousness. The techniques and the conditions to achieve the above are irrelevant. What counts is to reach a stage where we do not regard ourselves anymore as pieces of flesh within a separated reality. Here we move beyond the fiction of our boundaries and bridge into the essential vibration of ecstatic reality. Yet, as we engage with blissful energies, the ordinary world still continues to proceed around us. We remain aware of our environment and simply look at it as a witness, firmly grounded in the connection with our multidimensional nature. This dance is available to anybody who sincerely wishes to transit from the hallucination of separation to the perception of unity. Anyone who is capable of moving at least one bone of his body is in the right condition to dance. It is an inner operation, devoid of any purpose of public performance, aimed at revealing experiences and visions beyond time and space. Astroshamanic Dance is a powerful cathartic practice that can be effectively used as a method for shamanic journeys. This means that I can do all the traditional astroshamanic routine practices (i.e. meeting the Guide, exploring the Sectors, connecting with Totem Spirits, receiving Spirit Medicines, etc.) by using dance and movements, instead of sitting or lying down. In the Eleusinian Mysteries dancers representing the planets and stars danced around the candidate for initiation. In the Mysteries of Mithras twelve initiates wearing zodiac masks danced around the initiate. Similarly, in TheActs of John (97-102), the twelve disciples, representing the zodiac signs, hold hands and dance around Jesus. Before he goes to die, Jesus gets together his apostles in a circle, and, while holding one another’s hands as they circle in a dance around him, he chants a hymn to the Father. The patterns on the floor of many ancient Christian churches were designed as astroshamanic circular keyboard aimed at enhancing the practice of trance dancers. The Acts of John, together with many other Christian and Gnostic texts, were banned as heretical. The same veto applied to trance dance, which was since then considered insane, demonic, perverted and malefic. 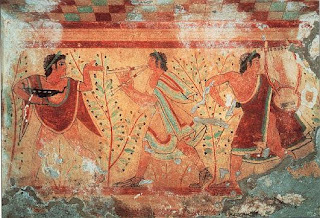 As a result trance dancers were heavily persecuted and many of them suffered horrible deaths. Yet trance dance is so grounded in the chemical and energetic structure of mankind that, despite its suppression, it has continued to survive and grow. My initial relationships with trance dance date back to the late 70s. At that time I was trying to come to terms with the impact of two overwhelming experiences I had in 1976, one close to Arthur’s Seat in Edinburgh and the other on the western bank of Loch Ness. On those two occasions, while I was observing the landscape I felt my body expanding through the whole environment, with my awareness entering into all the surrounding forms as if I were actually the land itself. It was a shape-shifting dance experience, yet I did not have any clue about what it meant. I was not under the effect of any drug and everything happened spontaneously. It was a most astonishing situation, yet what surprised me more was that, despite the paranormal nature of the experience, I was not surprised at all. I could not understand what was happening, yet it appeared very familiar, pleasant and safe. I also perceived an enormous amount of power, which was in dramatic contrast with the way I used to live then. This event later reawakened the awareness of a previous, even more powerful, experience I had as a child.. As a result of these events I began to do researches in the attempt of finding out more. In particular, since I continued to have recurrent visions related to the astrological archetypes, I decided to study astrology. While I was immersed in my astrological analytical work, I would often experience non-ordinary states of consciousness with dramatic effects on my body and emotions. I could not manage to limit astrology to an intellectual or analytical level. The planetary energies seemed to seize me, affecting my perception and urging my body to act accordingly. Since the movements I felt impelled to release were not compatible with my social environment, I had to find ways to express them in situations were nobody could see me. Hence, I decided to operate mainly at night or in dark environments. This was not at all an easy time. Most of what I learned here came as a result of extreme moments of despair, pain, alienation and fear. In the early 80s, after a vision quest and following my association with AFS Bogus, I received guidance on how to face the above issues. This led to the gradual elaboration of a system integrating astrology, shamanism and dance, which I later defined as astroshamanism. From 1988 I expanded this approach through the connection with the Indian master Osho. 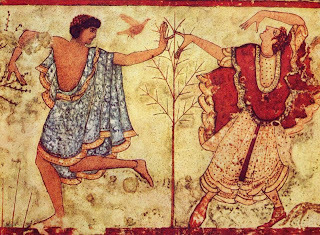 Running the Osho Meditation Centre in Bologna (Italy) and the Osho Press Service (Osho’s Italian press office), allowed me to regularly experience the effects of trance dance. Major inspirations came from my training at the Osho Multiversity in Poona (India), the contributions of Urai, the Sufi tradition, and above all through visionary researches with the Mediterranean mystery traditions and their dances, such as the tarantella. This led to the definite emergence of astroshamanic trance dance. When I came to Findhorn in 1999 I incorporated astroshamanic trance dance in my early workshops. Since then astroshamanic trance dances have been a regular feature at the Findhorn Foundation with events being held almost every week with the support of a trained core group of trance dance assistants. I am most grateful for all that has been achieved in this community, which after 13 years I still regard as the place on Earth closest to home. Training and courses are also featured in the programmes of Terra di Luce, our astroshamanic healing centre in Corvaro (Rieti, Italy) and have been held so far in Denmark, England, Finland, Germany, Greece, Holland, Ireland, Scotland, South Africa and Spain. 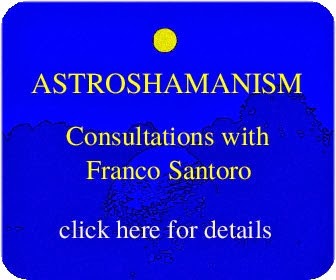 Astroshamanic workshop with Franco Santoro. For further information on Astroshamanic Trance Dance, please click here. For a selection of books on trance dance please click here. For a large selection of music for trance dance, please click here. [i] Osho, The Orange Book: the Meditation Techniques of Bhagwan Shree Rajneesh, Rajneesh Foundation, 1983, p. 8. This book, which contains a wide range of meditation techniques and precious insights, is out of print and is currently replaced by Osho, Meditation: The First and Last Freedom, St. Martin’s Press, New York, 1996.